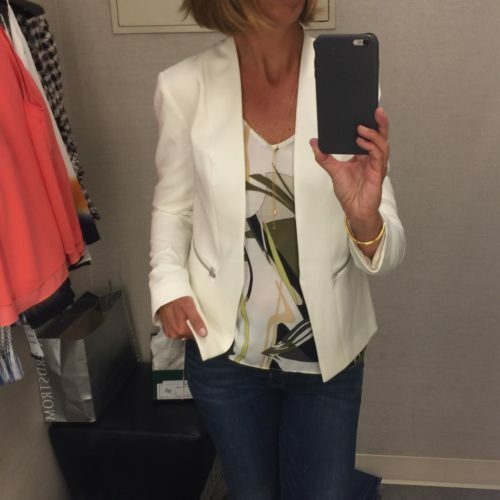 Today, in part 2 of my dressing room adventures; we’re shopping tops and blazers! If you missed Saturday’s shoe and denim round-up, pop on over to view the full post, HERE. You’ve been hearing me talk a lot about blazers and jackets for spring. I think a jacket, is an easy way to update your look this season. Lately, I have been wearing a jacket in lieu of a cardigan – I find it’s a great way to mix-up denim, skirt and dress looks. And a blazer adds polish to jumpsuits, rompers, even city shorts! First off, a black blazer is a must, like an LBD. Add in white, a pop of color, or a statement jacket- for fun extras! Shoulders: The shoulder seam should fit, at your shoulder. If your shoulder sticks out under the pad, it’s too small. If the seam is way past your shoulder, it’s too big. Torso: The jacket should follow your natural curves. This is why one blazer does not fit most. The most flattering piece, will follow your shape. For example, curvy girls should look for a style that nips in at the waist. 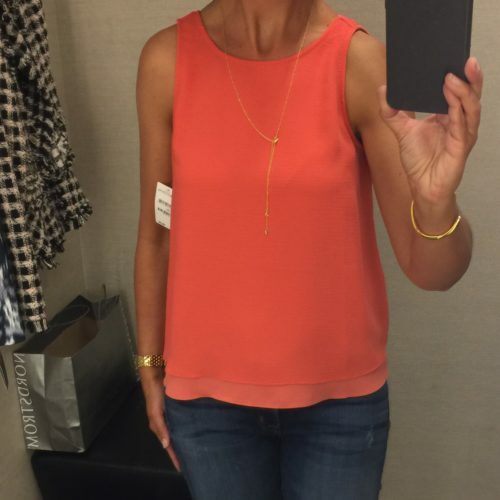 If you are petite, a v-neckline will make you appear taller. Also look for styles that sit high on the hip – to create the illusion of longer legs. Arms: a tight, uncomfortable blazer will simply not get worn. Once the jacket is on your body, cross your arms in front of you. By doing so, you’ll know if it’s too tight. If it pulls on your back, and you can’t move your arms – it’s too small. One of my favorite styles right now, is a simple jacket without a lapel – worn open. Flattering, on most everyone (get the length right), this style can be worn day or night – dressed up or down. Chelsea28 ‘Easy’ Crepe Blazer | Nordstrom | also available in a fun print! 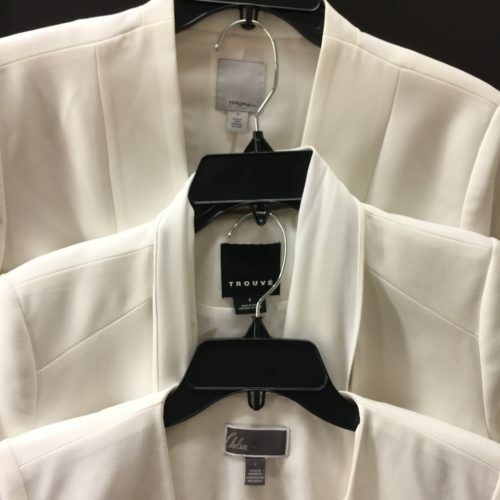 Look closely, these two jackets above are different. The second jacket goes to a point in the middle, creating a more hourglass shape on my straight up and down body type. Subtle, but there is a difference. Of the 3, this last blazer was my favorite. I almost didn’t try this jacket on as it has a strange zip-off lapel/scarf thingy that I just don’t understand. That said, it wouldn’t surprise me if style hits the sale rack, as the styling and hanger appeal is odd. Anyone else agree, that scarf add on is a miss? Maybe it’s just me. But on sale, just zip that scarf off, and I think you’ll have a great piece! 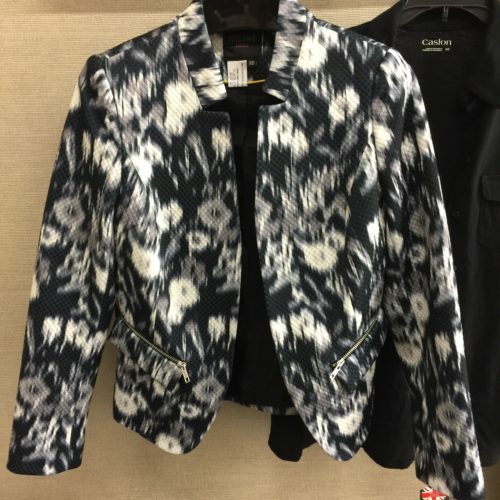 I also like THIS Trouve blazer (was not available for me to try on in store). It reminds me of Mackage, which would triple the price. 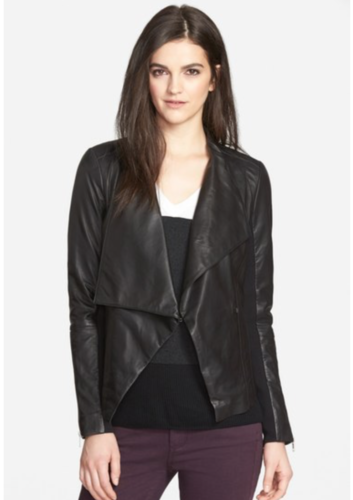 Looking for a deal on a drape leather jacket? I LOVE THIS one, also from Trouve, and now under $200.00! I’m loving a fun statement jacket right now. I loved the fit on this particular style. Shorter in the back and nipped in a bit at the waist. Notice there are no buttons – this style is meant to be worn open. The website suggests sizing down, but I liked the fit better in my regular size small. The XS (above) was too tight in the arms. So you have a jacket, now what top to wear underneath? 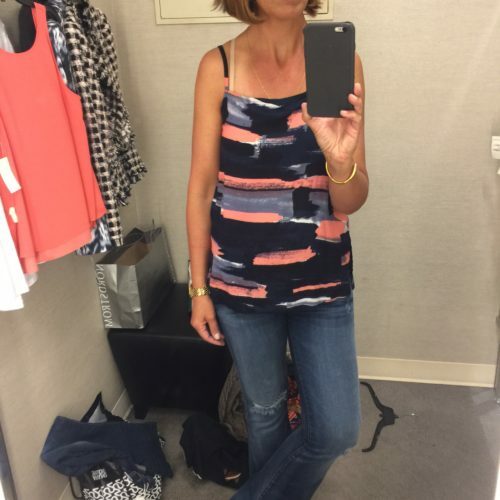 Some of my favorite tops to wear with blazers are from Ella Moss, Parker, Splendid, TopShop, DVF, Vince, Rebecca Minkoff, Cupcakes and Cashmere, Chelsea28, Haute Hippie, Joie to name a few. I personally like a tee tucked in with a fun belt, or a flowy cami that is a little longer than my jacket – tucked out. not sure how to handle that little bra strap issue? The Slub Panel Shirt retails for $155.00. 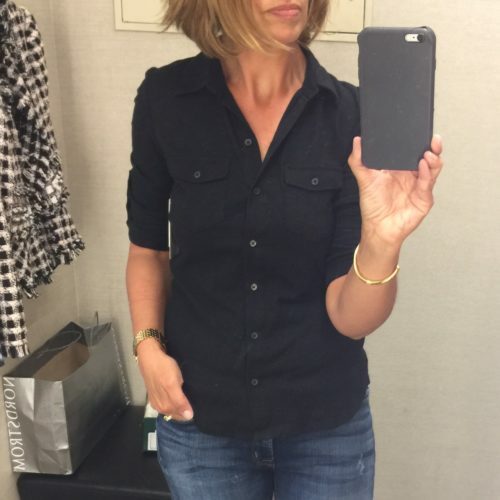 I bought this shirt in black, and sized down to an XS, for a more fitted shape. UPDATE: I did pick up my Hudson Mia crop flares from alterations – I love them. They are so much better at their new length. I have not had an opportunity to style them up for you all, but will soon – so stay tuned! Anyone else find it challenging to find just the right jacket? Anyone looking to find the perfect blazer this season? Share if you’ve found the perfect one, I know we’d all love to hear!